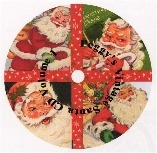 The Santa images on this CD are from many different scrapbooks. This CD contains all the Santa's that have been previously released plus some that aren't on any other CD at the moment. There are some really unique Santa's in this collection. This CD contains scans of 151 vintage cards. 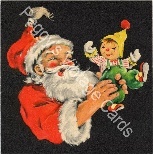 It has at least 250 vintage Santa Claus images. Plus it has at least 60 other supporting images such as toys, Christmas trees, candy canes, holly, boots etc. The cards on this CD date from the 1940s to the 1950s.